"At a time when our Government is approaching to Dissolution, when some of its Principals have been found utterly inadequate to the Purposes for which it was establish'd, & and it is evident that without some material Alterations it can not much longer subsist . . ."
"What is the situation of this country at this moment? Is it not rapidly approaching to anarchy? Are not the bands of the Union so absolutely relaxed as almost to amount to a dissolution?" "I will only add, as a further opinion founded on the maturest deliberation, that there is no alternative, no hope of alteration, no intermediate resting place, between the adoption of this [Constitution], and a recurrence to an unqualified state of Anarchy, with all its deplorable consequences." "The nation fell into an atrophy. The Union languished to the point of death. . . . The system was about to dissolve in its own imbecility--impotence in negotiation abroad--domestic insurrection at home, were on the point of bearing to a dishonourable grave the proclamation [in 1776] of a government founded on the rights of man . . . [when the Framing Convention met and brought forth the Constitution]: the complement to the Declaration of Independence . . ."
3. Violations [by the States] of the law of nations and of treaties. 11. Injustice of the laws of the States. Some of the contemporary criticism of The Framers has been translated unsoundly by some modern writers into the ridiculous accusation that, by framing the Constitution instead of proposing amendments to the Articles of Confederation, The Framers perpetrated a coup d'etat. Nothing could be more absurd--indeed, violative of historical truth--than this charge, made with the evident purpose of belittling these leaders and undermining respect for them and their handiwork in the minds of the American people and especially the Young. Brief discussion will make obvious the absurdity of any such contention which all pertinent historical records prove to be false. In number 43, Madison also discussed the point that the proposed, new Constitution would supersede the Articles of Confederation (only by consent of the people, if ratified). "WE HAVE now the honor to submit to the consideration of the United States in Congress assembled, that Constitution which has appeared to us the most adviseable. "The friends of our country have long seen and desired, that the power of making war, peace and treaties, that of levying money and regulating commerce, and the corresponding executive and judicial authorities should be fully and effectually vested in the general government of the Union: but the impropriety of delegating such extensive trust to one body of men is evident--Hence results the necessity of a different organization. "It is obviously impracticable in the foederal government of these States, to secure all rights of independent sovereignty to each, and yet provide for the interest and safety of all--Individuals entering into society, must give up a share of liberty to preserve the rest. The magnitude of the sacrifice must depend as well on situation and circumstance, as on the object to be obtained. It is at all times difficult to draw with precision the line between those rights which must be surrendered, and those which may be reserved; and on the present occasion this difficulty was encreased by a difference among the several States as to their situation, extent, habits, and particular interests. "In all our deliberations on this subject we kept steadily in our view, that which appears to us the greatest interest of every true American, the consolidation of our Union, in which is involved our prosperity, felicity, safety, perhaps our national existence. This important consideration, seriously and deeply impressed on our minds, led each State in the Convention to be less rigid on points of inferior magnitude, than might have been otherwise expected; and thus the Constitution, which we now present, is the result of a spirit of amity, and of that mutual deference and concession which the peculiarity of our political situation rendered indispensable. "That it will meet the full and entire approbation of every State is not perhaps to be expected; but each will doubtless consider, that had her interest alone been consulted, the consequences might have been particularly disagreeable or injurious to others; that it is liable to as few exceptions as could reasonably have been expected, we hope and believe; that it may promote the lasting welfare of that country so dear to us all, and secure her freedom and happiness, is our most ardent wish." By "one body," Washington referred to the Congress of the Confederation. By the word "consolidation," he meant effective, though partial, unification politically of the States through the federation of Republics (central and State) as provided in the Constitution. With regard to his reference to giving up "a share of liberty to preserve the rest," attention is called to Paragraph 8 of Principle 3 in Part I. Never before in all history in any other country had any such steps--in part, or as a whole--been taken to insure the people's consent to the establishment of their form of government. 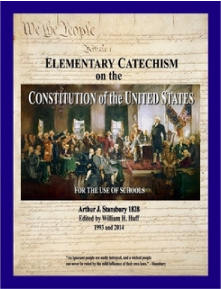 The foregoing summary of events presents irrefutable evidence of an unprecedented performance by all public servants involved--including the members of the Framing and Ratifying Conventions--acting strictly in accordance with their limited duty as the agents of the people, to the end of enabling the sovereign people of each of the States to exercise to the full freedom of choice in forming a central government for the greater security of their unalienable rights, in keeping with the ideals, goals and principles of the Declaration of Independence as summarized in the Preamble to the Constitution. Nothing in history even matches, much less surpasses, this record when judged by the severest standards of integrity and all other pertinent tests of the highest type. In the light of the foregoing discussion, it is self-evident that any one who asserts that The Framers perpetrated a coup d'dtat thereby flouts historical truth and exhibits lack of either scholarly competence, or intellectual integrity. If one thus culpable be a professional educator, such misconduct also involves betrayal of the duty aspect of Academic Freedom-Responsibility, which includes above all else the above-mentioned elements: scholarly competence and intellectual integrity; and, furthermore, it robs the affected students of their right to freedom of choice based upon correct information and instruction which is sound in every respect. Any such unjust attempt to defame The Framers, or others among The Founders, amounts moreover to character assassination--a grossly anti-moral offense which is as cowardly as it is indefensible when perpetrated against our forefathers, unable to refute with the truth. The Founders are also sometimes attacked as having been crass money-seekers at the expense of the people's liberties, which historical records prove to be false. This topic merits extended discussion but lack of space requires brevity in the following comments about it.